After several months of thumb arthritis, and cancer pain, I am needing to do some ART, so………………….. to heck with all the pain stuff, here we go! 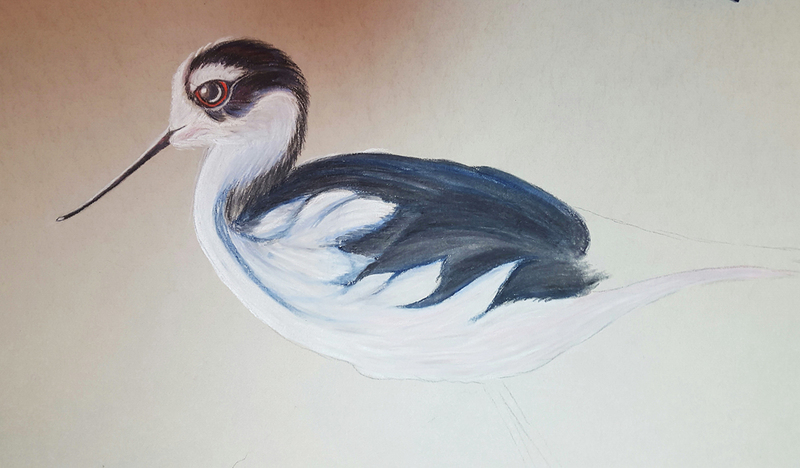 This Drawing is going to be a couple of Black Necked Stilts. Holding a brush or pen is not working, so it is back to pastel pencil, which should be a good medium for these little cuties. I can maneuver the pencil without bending the thumb with light pressure using wrist motion, so onward and forward! The blending is painful, but I will work through it since these little pastel drawings don’t take as long as a painting or large charcoal drawing. This is resting week as you have probably guessed. We see the oncologist Monday and should get an updated CEA count since the resumption of chemo. I am back to my Rip Van Winkle impressions during chemo week, probably won’t have a blog update until late in the week after waking up.